A young woman, driving a Mini Cooper, who crashed into two pedestrians, killing the husband and severely injuring his wife, has been placed on a Community Payback Order for 12 months, ordered to carry out 200 hours of unpaid work and disqualified from driving for two years. Samantha Goff (23) of Farquhar Terrace, South Queensferry, had passed her driving test just six weeks before the fatal accident on January 30 last year. Goff pled guilty at Edinburgh Sheriff Court last month to causing the death of 60-year old Alan McBain and severely injuring his wife, Dawn McBain, by driving without due care and attention, failing to maintain proper observation, failing to take appropriate action to pass the couple, losing control of her car and crashing into a field. Sentence was deferred until today(June 12) for reports. Mr and Mrs McBain had been keen walkers for around 16 years and just after 11 am on the day of the accident Mrs McBain phoned her daughter to say they were going for a walk. 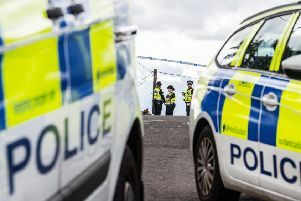 They were walking eastwards in single file along an unclassified road between Standingstane Road and the Kirkliston to South Queensferry Road, facing the on-coming traffic and wearing purple jackets, when they were struck by the Mini Cooper coming in the westerly direction. The car became airborne and landed in a field. Goff made a 999 call and said: “I have just been in a car accident. I have crashed into two people”. She added: “I came round a corner and saw two people right in front of me. I tried to swerve and they went the same way. I tried to go the other way and that’s when I Iost control”. When police officers arrived, she told them the couple had moved towards the road verge and she had moved the right, but thought she may have hit a piece of ice and lost control of the car. An investigation into the accident estimated that Goff had been travelling at 37 mph. The speed limit on the unclassified road was 60 mph. Mr McBain was attended by paramedics at the scene, he suffered injuries to his head, chest and abdomen and was pronounced dead at 12.30 am. Mrs McBain had no recollection of the crash due to her critical injuries, had been put into an induced coma and was in hospital for five weeks. Her spine had been broken and she had injuries to her skull and suffered from memory loss. She had two operations on her leg and back and may have to have another operation. She is now in constant pain and uses a walking stick. Defence solicitor, Cameron Tait, told Sheriff Donald Corke: “This is a tragic case”. The accident, he said, was a combination of driving without due care and attention and his client’s lack of experience. She had telephoned the police immediately after the accident and admitted striking the couple. He added: “She struggles to come to terms with the consequences of her actions and relives the accident on a daily basis”. Mr Tait added that there was no prolonged course of bad driving. It lasted approximately 30 seconds, no alcohol was involved, no excessive speed and the vehicle was well maintained. Sheriff Corke told Goff she had had plenty of time to see the couple on the narrow road which had hedges on both sides, making it difficult for them to escape the car. Mr McBain, he added, was on the cusp of a well earned retirement. Mrs McBain had suffered life-changing injuries, left with physical and mental scars. “Nothing I can say can make it better” he said.